I think the KDrama Baby Faced Beauty is quite underrated. I happen to like the story and even the characters, I admit I am biased to Lie To Me (because of YEH) and Best Love (it’s a Hong Sisters drama) and at first I am kinda irritated with Jang Na Ra and Daniel Choi’s bickering. But little by little their characters grew into me. The scenario is also based on a lie and with ep 10 where the lie was taken out in the open, we have the second half (yup, additional 2 eps so we got 20! )to let our heroine salvage her pride and prove to everyone she got what it takes to be a designer. Of course, there’s additional problems along the way. 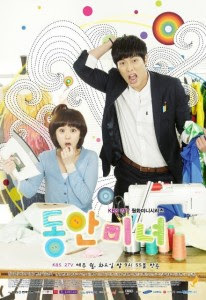 I find Jin Wook’s character kind of cute and lovable. I would be happy to be the bride of a pig-foot-restaurant-owner too! Maybe if BFB was not shown in May and not pitted to Lie To Me and 49 Days (which ended already and dried my tear ducts) then City Hunter (Lee Min Ho oppa! ), they would get more following or more hype. Although among the 3 Kdramas shown in Mon-Tues timeslot BFB rated #1 followed by CH and my fave LTM (huhu).